This photos shows Connie Britton at the Emmy's wearing a velvet Naeem Khan gown with a gold encrusted lace on the left, my inspired by nails in the middle and the same gown being shown at the New York Fashion Week Fall 2013 in February this year. I started with a base of aEngland St George. I then applied a mix of flocking powder that I put together to get the right shade. It included dark green, bright blue and royal blue flocking powders. I was really happy with how the flocking powder represented the velvet gown. Once the flocking powder was set in place I used some clear polish along the french tip and then dipped my nail in gold micro beads. I also added a dot of polish at the top of my nail and put micro bead there too. 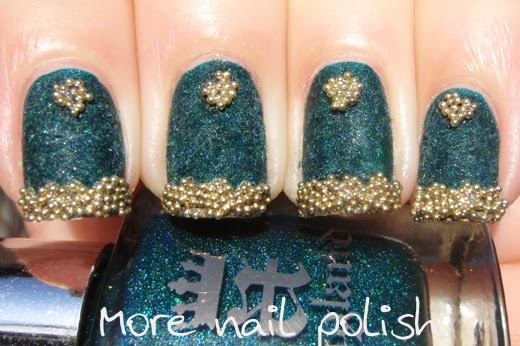 Once they were dry , I added some top coat just over the beads to ensure they stayed in place. And let me tell you, I thought these would fall off during the day, but nope, they stuck hard and fast. The bead look rather messy looking at them up close, but again I think they represent the gold encrusted lace on the gown quite well. It's certainly a combination that is a bit out there, but it's always good to push your boundaries. 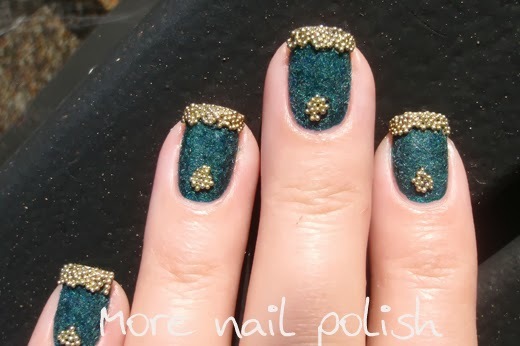 Cool nails! And Connie Britton look amazing in that! Congrats! You Blog Your Heart Out and deserve some love!! I love this so much! And I loved her dress! You showed the texture perfectly. 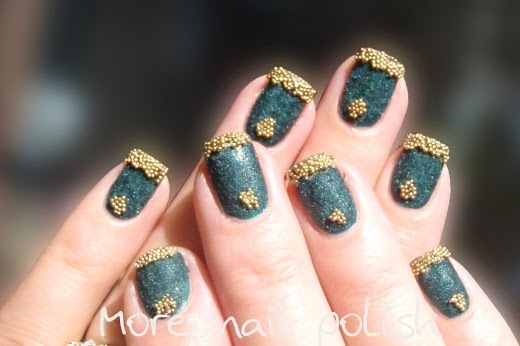 Oooh love the beads, how creative! Love the texture of the flocking powder you mixed up! This is so pretty and interesting! I loved this dress! They tried to bash it on Fashion Police the other night, but I thought it was unique. I noticed the dress from the Emmy's and thought it was gorgeous! I love your take on it! I would never ever wear nails like that but I love how you managed to practically get the dress on your nails. Very cool work (and the dress is gorgeous!)! I looooved this dress so much when I was watching the Emmy's, I had it pinned (http://www.pinterest.com/pin/178032991493070370/) before the Emmy's were even over. Also Kaley Cuoco's gorgeous dress (http://www.pinterest.com/pin/178032991493070386/). How great to see such a beautiful interpretation of Naeem Khan's creation. 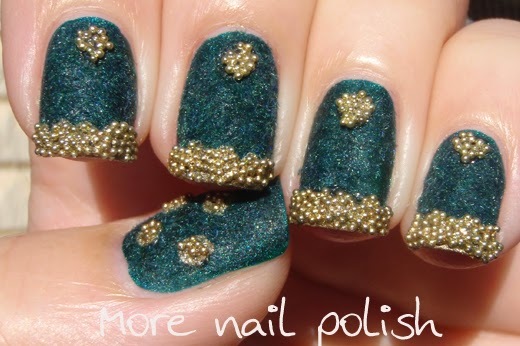 I'm not a fan of flocking but I can see that it was imperative for flocking to be used in this mani. Lovely!